The 2009 Honda Odyssey remains a strong seller, so deals can be difficult to come by. The 2009 Honda Odyssey doesn’t just have the practicality that’s expected in a minivan; it’s fun to drive, too. 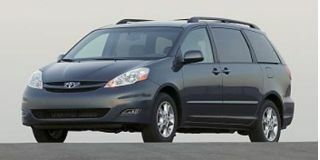 The minivan experts at TheCarConnection.com have studied a range of road tests of the 2009 Honda Odyssey to put together this conclusive review. TheCarConnection.com's editors also drove the Honda Odyssey to help you decide what is best for you and point out where opinions might differ. 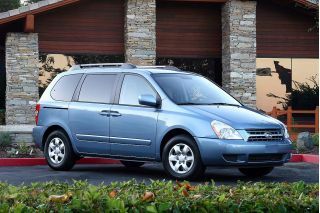 Honda’s minivan model, the Odyssey, was introduced in its present form in 2005 and saw some significant changes last year. For 2009 only the EX-L trim level receives additional upgrades, including a power tailgate and Bluetooth HandsFreeLink. The Honda Odyssey’s fresh look isn't startlingly good or bad to TheCarConnection.com, but it doesn't matter because people don't typically buy minivans based on looks and emotion. They buy minivans simply because they are practical. The 2009 Honda Odyssey LX and EX models come standard with a 3.5-liter VTEC V-6 engine that delivers a vigorous-feeling 244 horsepower and fuel economy ratings of 23 mpg highway. The EX-L and the Touring are fitted with cylinder deactivation technology, which raises the highway rating to 25 mpg. This technology shuts down half of the cylinders at cruising speeds for added fuel efficiency; the only consequence is that it produces 241 hp instead of 244 hp, but you'll never notice the difference—except at the fuel pump. Neither version is very efficient in city driving, with EPA figures of either 16 or 17 mpg. A five-speed automatic transmission is standard with both engines. TheCarConnection.com editors continue to be impressed with the handling of the Odyssey. The 2009 Honda Odyssey uses a four-wheel-independent suspension that helps this minivan handle really well. 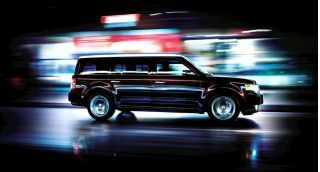 What makes Odyssey stand out in this respect is that the crisp handling does not come at the expense of a smooth ride. The interior design is clean and functional. However, the center stack of controls are scattered around and it takes some time to get used to the arrangement. 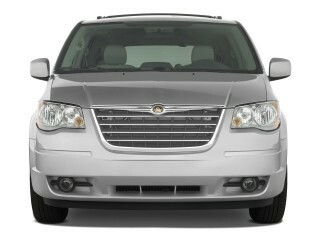 The Odyssey uses heavy, second-row seats that are difficult to remove; the Chrysler Stow 'n Go system is much easier. The third-row seat on the Odyssey does fold into a deep well in the rear of the van. When the seat is up, this is an ideal location for grocery bags or other cargo. The four trim levels available on the 2009 Honda Odyssey are the seven-passenger LX and eight-passenger versions of the EX, EX-L, and Touring. Honda groups options by trim level, so while the base LX is well equipped, more equipment becomes standard as you move up in price. The 2009 Honda Odyssey Touring is downright luxurious, trimmed in leather and fitted with a navigation system and rear-seat DVD entertainment system. The quality of the interior is high in terms of fit, finish, and materials. 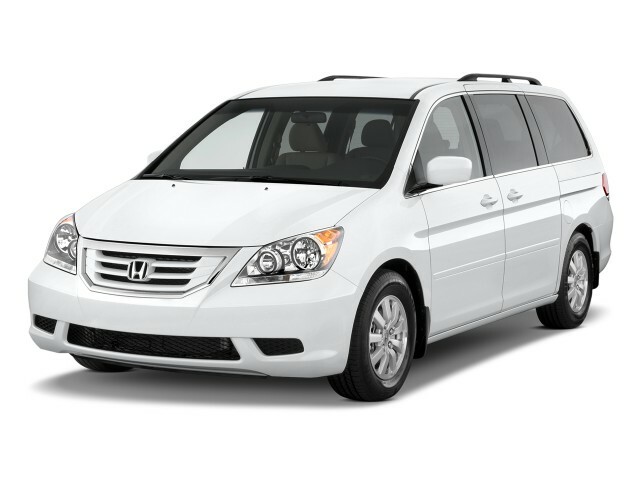 The Odyssey has performed well in government and IIHS crash tests, and like all other Hondas, the 2009 Odyssey comes standard with stability and traction control, in addition to side and curtain airbags. To keep things lively, the 2009 Honda Odyssey offers a DVD entertainment system with wireless surround-sound headphones and a voice-activated navigation system that incorporates both a rearview video camera and XM Satellite Radio as options. An MP3-capable CD player and an auxiliary jack for MP3 players come standard. Bluetooth is available on Touring editions; a rearview camera is now standard on EX-L models, and memory side mirrors are now standard on the Touring. A power front passenger seat is also standard for 2009 on the EX-L and Touring models. On the outside, the 2009 Honda Odyssey is just a minivan, but inside it’s styled a little more than you might expect. For 2009, the Honda Odyssey upgrades the EX-L trim level, expands the application of Bluetooth, and adds a power tailgate to the Odyssey EX-L. The look of the Odyssey isn't startlingly good or bad, but it doesn't matter because people don't buy minivans based on looks and emotion. Car and Driver appreciates the updates, saying, "Now there's a minivan we don't mind driving." MotherProof agrees, describing the Honda Odyssey as "elegant, poised, smooth ... [with] sleek lines and subtle accents." Autoblog says, "Honda has dressed up the Odyssey with some styling tweaks, including ... front bumper fascia." 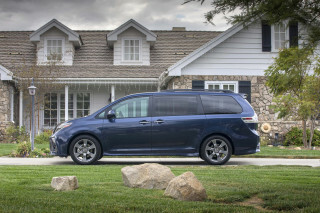 Cars.com notes that the Honda Odyssey "continues its trend of exterior and interior changes." The interior design is clean and functional. However, the center stack of controls are scattered around and it takes some time to get accustomed to the arrangement. Cars.com, for example, points out the Odyssey's “gearshift lever sits on the instrument panel." ConsumerGuide finds "it's easy to reach but obstructs some controls when in park." Elsewhere, ConsumerGuide likes the "large, clearly marked main gauges." MotherProof says "subtle backlighting creates an elegant view of the instrument panel," and Autoblog points out the "interior has received new colors, textures and fabrics, as well." Improved fuel economy and carlike handling are two strengths of the 2009 Honda Odyssey. The 2009 LX and EX models come standard with a 3.5-liter VTEC V-6 engine that delivers 244 horsepower and 16/23-mpg fuel economy. The EX-L and the Touring are fitted with a 3.5-liter engine that utilizes cylinder deactivation technology. This technology shuts down half of the cylinders at cruising speeds for added fuel efficiency. This engine is rated at 17 mpg city, 25 mpg highway. This more efficient engine produces 241 horsepower, or 3 hp less than the base engine, but you'll never notice the difference—except at the fuel pump. A five-speed automatic transmission is standard with both engines. "Engines in the LX and EX make 244 horsepower and 240 pounds-feet of torque; EX-L and Touring engines are good for 241 hp and 242 pounds-feet of torque," reports Cars.com. The 3.5-liter V-6 that moves the Honda Odyssey provides very respectable acceleration, especially in a class that isn't known for performance. Edmunds says the "V-6 complements the van's likable road manners, providing satisfying acceleration in virtually all situations." ConsumerGuide is also impressed by the Honda Odyssey’s performance, calling the acceleration "ample around town and when merging onto highways, even with a full complement of passengers." The transmission is generally without major fault, although ConsumerGuide points out the gearbox "doesn't always downshift promptly in passing situations." Cars.com notes, "Honda's 3.5-liter V-6 teams with a five-speed automatic transmission." The more advanced engine improves fuel economy, and Autoblog corroborates the claim: "VCM improves fuel economy of the 3.5L from 16/23 to 17/25, which isn't a huge jump, but may be appreciated by parent-run chauffeur services." 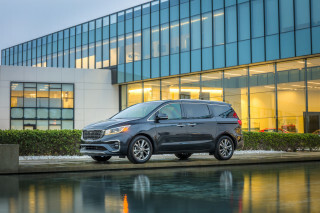 Edmunds calls the Honda Odyssey "the most car-like minivan on the market today, thanks to its tight turning radius, responsive steering and athletic tuning." ConsumerGuide likes the Odyssey's "sharp, accurate steering," but cautions potential buyers about the Honda's ride over rough roads, "where sharp bumps and highway expansion joints sometimes jab through—especially to rear-seat riders." Editors from TheCarConnection.com continue to be impressed with how well the Odyssey drives, and its good handling does not come at the expense of a smooth ride. Edmunds finds the Odyssey "easy to pilot," but warns that "its bulk can be a hindrance if you're never taking extra passengers or gear along." As for braking, ConsumerGuide notes, "stopping control is good even with a full passenger load." 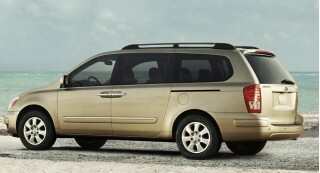 Seating in the Chrysler is a better system, but the 2009 Honda Odyssey is a spacious and well-outfitted minivan. The 2009 Honda Odyssey delivers a comfortable cabin for up to eight passengers. While the 2009 Odyssey EX, EX-L, and Touring models can seat eight people, passengers of the standard Honda Odyssey have seven seats to choose from. "Thanks to a removable center seat in the second row that can stow into a recessed compartment, which can be used for storage when the seat isn't stowed," says Cars.com of the EX, EX-L, and Touring models. ConsumerGuide calls the front seats "comfortable and supportive," and proclaims the Honda Odyssey's room "ample for large adults." ConsumerGuide also enjoys "a fine driving position," which is "enhanced on Tourings by power-adjustable pedals." The 2009 Honda Odyssey doesn't disappoint when it comes to rear seat room, although ConsumerGuide once again chimes in with a comment about the third-row seat, which they claim "has adult-size room, but seat suffers a short backrest and thin padding." Kelley Blue Book notes "Honda engineers have made the third-row seat more accessible, thanks to sliding second-row seats." For some minivan buyers, the versatility of the seating and cargo arrangement is the top priority. Here, the Odyssey isn’t best in class. The second-row seats of the Honda Odyssey are heavy if you need to remove them for cargo; the third-row seat on the Odyssey does fold into a deep well in the rear of the van. When the seat is up, this is an ideal location for grocery bags or other cargo. ConsumerGuide is impressed by the well behind the 2009 Honda Odyssey's third-row seat, which "swallows a surprising volume of cargo." Cars.com enjoys the "Lazy Susan under-floor tray holds miscellaneous items in Touring models." Edmunds provides the facts on the Honda Odyssey: "With the third row stowed, the Odyssey offers 91 cubic feet of cargo volume behind its second-row seats." There is only one problem with the storage availability in the Honda Odyssey: ConsumerGuide lodges a complaint against the Odyssey: "Under-floor compartment adds extra storage but is not readily accessible." MotherProof has some quibbles about the cup holders as well: "The two front upholders don't fit cans easily .... The other two cup holders held the can steady but were difficult to reach." 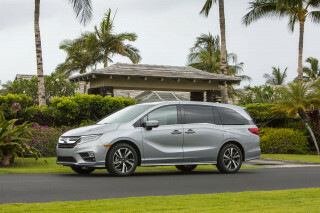 ConsumerGuide calls the Honda Odyssey's materials and assembly "top-notch," but "one tester exhibited several squeaks and rattles from aft area," an experience noted by TheCarConnection.com’s editors as well. Honda’s reputation for high quality continues with the interior of the Odyssey. Remaining quiet while commuting is important for modern minivans, and the 2009 Honda Odyssey complies nicely. ConsumerGuide reports that the Honda Odyssey "is among the quieter minivans. Engine noise is particularly well subdued. Road noise is prevalent at highway speeds, especially with the run-flat tires." They do note passengers in the third row "hear some wind whistle around the tailgate that grows tiresome on long trips." The 2009 Honda Odyssey performs well in crash tests and offers a myriad of standard and optional safety equipment. Minivan owners are concerned more about safety than consumers shopping for other types of vehicles, and the 2009 Honda Odyssey doesn’t disappoint. The Insurance Institute for Highway Safety (IIHS) grants a "good" rating for frontal offset crash tests to the Honda Odyssey; 2009 models receive the same rating for side impact tests. The National Highway Traffic Safety Administration (NHTSA) gives the Odyssey top marks for crash safety, granting it five out of five stars in front impact and side impact protection, and four stars for rollover resistance. Cars.com confirms the abundance of safety equipment on the 2009 Odyssey: "Side-impact and three-row side curtain airbags, all-disc antilock brakes, and traction control are standard, as is an electronic stability system." Additionally, Motor Trend notices the "2009 model adds active front seat head restraints and daytime running lights as standard equipment." On the Honda Odyssey, 2009 buyers can also get a unique option. "For the Touring trim, Honda offers Michelin PAX run-flat tires, a technology that allows punctured tires to be driven on for more than 100 miles," reports Edmunds, which also has a complaint about the unusual run-flats, noting that the high-tech tires "typically cannot be repaired when a puncture does occur." Other optional safety gear available on the 2009 Honda Odyssey Touring model includes a "front- and rear-obstacle-detection system,” says ConsumerGuide. ConsumerGuide reports that "rear visibility is hindered by large headrests and thick roof pillars," though the optional "rearview camera and front and rear park assist help in close-quarters maneuvering." Because Honda bundles convenience features with upgraded trim levels of the 2009 Honda Odyssey, consumers are forced to step up to more expensive models in order to get the vehicle they want. The four trim levels available on the 2009 Honda Odyssey are the seven-passenger LX, and eight-passenger versions of the EX, EX-L, and Touring. Honda groups options by trim level, so while the base LX is well equipped, more equipment becomes standard as you move up in price. The 2009 Honda Odyssey Touring is downright luxurious, trimmed in leather and fitted with a navigation system and rear-seat DVD entertainment system. The quality of the interior is high in terms of fit, finish, and materials. Cars.com notes that the high-end Touring model "has standard DVD entertainment and navigation systems; those systems are also available in EX-L models, though navigation can only be had in combination with the entertainment system." ConsumerGuide is not necessarily a fan of the gadgets on the high-end Honda Odyssey models: "EX, EX-L, and Touring have an abundance of buttons, switches, and more complicated control design that takes time to understand." 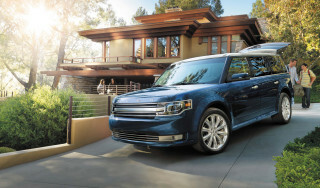 According to Kelley Blue Book, options exclusive to the "premium Touring model are a power tailgate, memory driver's seat, power-adjustable pedals, front and rear parking sensors and a run-flat tire system." Motor Trend reports that "four new premium options have also been made available, including a Bluetooth HandsFreeLink, four-way power passenger seat, rearview camera display, and memory-linked side mirrors with reverse gear tilt-down. DVD entertainment and voice-activated navigation units also are available." XM Satellite Radio is optional on most Odysseys. Great van for hauling camping equipment & packing fleamarket items so i use it alot.Quiet smooth riding glad I own one. We feel like a million bucks in this car, and it comfortably seats our family of 5, plus cargo.